Europa Holiday is a travel agency based in the San Gabriel Valley. They specialize in English and Chinese tours throughout Europe and various parts of the world. As a returning client of ours, Europa commissioned Ready Artwork two years ago to redesign a website for their business. Since the launch of the new site, we have been managing their marketing campaigns and they currently also have ongoing graphic design projects with us as well. The majority of the graphic banners designed for Europa are often used for the company’s website as well as for marketing collateral. 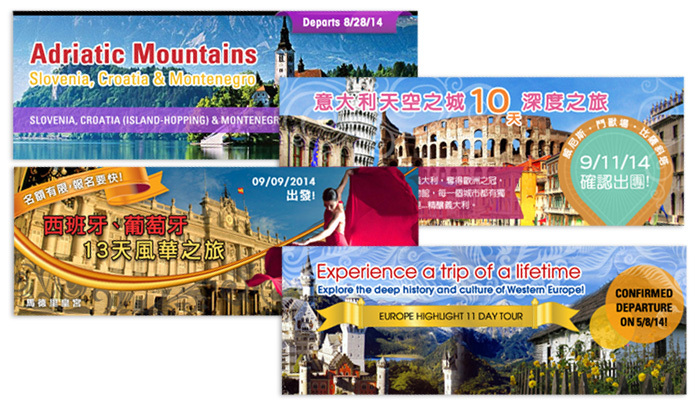 Because Europa specializes in both English and Chinese tours, one of the initial challenges our designers faced was being able to create banners which would satisfy and cater to both audiences while keeping the banners consistent in both look and feel. After consulting with the client, we suggested to have two separate banners created for each campaign, one for English speakers and one for Chinese speakers. The team felt that this way, viewers would have a more positive experience when visiting the website and viewing banners in newsletters and social media. Because each tour offered by Europa consists of many different places, landmarks and activities, our designers worked especially hard to portray the beauty that each destination and culture has to offer travelers. Working together with the client, our graphic designers individually select stock photos to collage and display throughout the banners. Along with choosing appealing images, our team also spends extra time developing text and icons that will create urgency and a call for action to increase sales and signups for Europa tours.